Robin Olsen has lived for half a century and has been educated in fine schools. We learn a lot just going through life and making mistakes. Do you think gun ownership should be allowed? For most this is actually pretty basic, either we are hunters or farmers and it is quite easy to see why a gun (at least a long gun) is required. But there are those who own guns for entirely the wrong reasons. I don’t mean to anger anyone but some of this may. Here are some of the things I consider to be flaws in the attitude of gun ownership. Hunters: A good reason to own a firearm in my opinion is hunting. But, hunters have no real use for handguns as they are pointless for hunting as the accuracy of a short barreled gun is not that great nor is the range that great either. Automatic weapons were never designed for hunting, most hunters live off of the 'one shot one kill' rule when it comes to shooting and most Automatic weapons are actually meant, from the design table forward, to kill humans almost exclusively. Farmers: Need to control more than just random criminals, they have natural predators stocking their livestock and even their family members occasional so yes definitely need the farmers to have access to firearms. Again, I see no justification for a side arm or an automatic weapon. A simple long gun will give the farmer everything he needs. Gun Collecting: Seriously? Is this the only thing you can think of to collect? I spent time in the infantry and used a wide variety of small and medium arms and mortars, rocket launchers, turret guns, etc and I loved every minute of it but to own a .50 cal is pointless in the extreme. I cannot legally hunt with it and did you know it is actually against the Geneva convention to even use it against a human target? .50 cals are anti-vehicle weapons and the .50 cal MG is designed and used primarily to take out soft vehicle targets by the military and occasionally to hit a hardened target like a bunker. No consideration should be given to simple collectors when it comes to gun control, let them collect stamps. No civilian in either country can properly justify owning a .50 cal or any other heavy weapon. ‘Home defense’ enthusiasts : Really can’t think of another nice way to describe someone who is brain dead enough to surround themselves with massive amounts of various different types of guns in their homes then think for even one split second that they can defend that home from a hostile invading army! Take it from someone who has been schooled in infantry tactics you can never defend your own home from a hostile invading army. They will do one of three things: 1. They will blow your house up with an airstrike and kill you, destroy your guns (all of them) and kill whoever else in your family that was dumb enough to believe that this type of defense tactic could actually work. 2. They will by pass your house and mark it for an artillery strike (same result as #1 above) 3. They will overwhelm your ‘defenses’ with massive fire power superiority (cause ‘HEY’ you can only fire one gun at a time eh?) and burn your house to the ground with you and your family and all your guns along with it. You cannot defend your home against an invading army especially if they already drove out your own army from the area. Your only option is to defend your family and to do that you must be willing to actually abandon your home and fight mobile, moving constantly from one place to another and adopting an ambush mentality when it comes to dealing with the enemy, and even then prepare for a very long and uncomfortable campaign in which you will constantly be outnumbered, outgunned and on the move. But as proven in Vietnam, you can win a campaign like this if you are smart about it. But you will not want 50 different types of guns to be carrying with you all over the place. So here is another group that should get very little consideration when it comes to gun control. Most of the home defense types are completely unaware about what kind of threat they can logically oppose while remaining stationary. Currently, in both Canada and the USA, gun control seems to be handled almost exclusively by the central authority, IE: Washington (USA), or Ottawa (Canada). 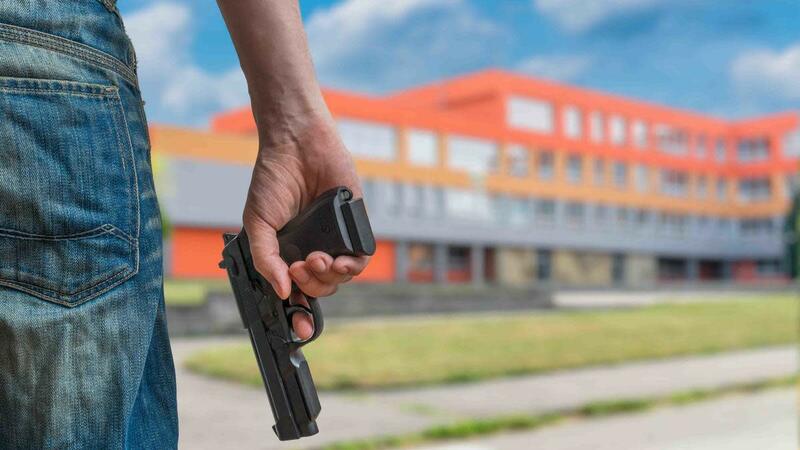 The debates go around and around and we hear many things about our rights to self defense and safe schools and communities, and it seems almost impossible for an entire population to come to some sort of consensus on the issue. I have a simple theory, when an entire population in a country the size and complexity of both Canada and the USA (2nd and 4th largest respectively I believe) cannot come to a consensus on an issue it is probably a very good indication that the issue in question should not be in the hands of the central authority in the first place. Do we really think that the entire population of the USA, from Hawaii to New York and from Alaska to Texas will every come to a general consensus on an issue like gun control? How about the entire population of Canada from the North Pole to the Great Lakes and from Vancouver to Halifax? It would seem almost impossible to come to some sort of understanding given the current area of responsibility that gun control falls under. The problems caused by the improper association of gun control with the federal (central) authority has caused other issues as well as each ‘side’ of the political spectrum tries to drum up support with this or that fabrication around gun control, especially in Canada. 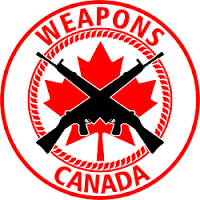 In Canada there is false ‘East’ vs. ‘West’ conflict propagated by the central politicians who want us to believe that Eastern Canadians want a total ban on guns while Western Canadians want unrestricted weapons ownership. Two completely opposite ends of the spectrum but the entire ‘conflict’ is a red herring and in no way actually represents the desires of the people in those regions. A quick study of the situation tells me that the lines of the debate are not drawn ‘East’ vs. ‘West’ at all but rather Urban vs. Rural lifestyle. In the USA, each and every tragedy is thrown into a very bright spotlight and used as political fodder for whatever politician is currently looking for a soap box to stand on, dragging victim’s families along for the horrible ride every step of the way and, in either country, it is the people and their wishes and concerns that are ignored while these centralized actors playing the roles of politicians sing some irrelevant song and dance while trying to get support for their specific position. Then there is corporate influence, you know, those guys that make and sell guns? They certainly don’t want further restrictions on what they wish to sell and would probably like even less restrictions regardless on social impact and yet these guys have lobby groups in the USA (to a lesser extent here in Canada too) that specifically try to sway the political opinion in their favor. These groups, including the NRA, are not representative of the people and should not be given a very loud voice in this debate and yet theirs is the loudest voice of all. So, currently, we have an issue about gun control that needs to be sorted out yet we are beset on all sides by those with conflicting personal or corporate interests and who do not represent the people of our nations. Do you consider it reasonable for cities to determine their own gun laws? So what should gun control look like? First thing to sort out, even before the lobby groups and politicians can be addressed is; What level of government should be responsible for gun control? To me the answer should be based on the current major division between the pros and the cons in this debate – that being rural vs. urban populations. Both have very good reasons for their respective positions, both should be listened to and both are at polar opposites of the gun debate spectrum. So how do we bridge this gap, after all, we are all one nation (or two I guess seeing as though I am trying to reach both countries), rural or city folk and it is beholding on us to come up with something acceptable for everyone. Having said that, I do not feel it is possible for the entire population to come together over this issue nor should we expect that to happen. So what then? Personally, I think that gun control should be removed from the scope of the central authority altogether. This would immediately render groups such as the NRA and all the other various lobby groups in both Canada and the US obsolete almost overnight. It would also remove the abhorrent use of tragedies to foster a specific political agenda, regardless of what that is. Then whose responsibility is it? That depends on one thing…where you live. I mean that in the most basic of ways. If you live in a city then the mayor and city council should be responsible for gun control within that city and should have the freedom to set whatever limits that the people living in that city demand. If you live rural then the state\provincial government should be the determining body of what a legal weapon is or is not. This way the people can take a more active voice in determining the limits of gun control and the federal government can be relieved of coming up with a ‘one size fits all’ solution that is acceptable to the entire country (which seems almost completely impossible for them to do anyways given the regional differences we have in both countries). In order to avoid the chaos caused by widely different gun laws there are a couple of things that need to be done. First, the federal authority needs to make a statement saying that the constitution (or bill of rights here in Canada) needs to be upheld and respected. Second, a general rule (or law) that prohibits cities from legalizing any gun that they state\provincial authority has already banned. Cities can certainly make illegal any gun at all. Rural people should not be under the same constraints as city folk when it comes to weapons possession and ownership. Rural people face a number of challenges that city folk will never face. One is police response times, in a North American city, this is relatively quick, usually within 5 minutes or less, sometimes way less. In a rural community that response time can go as high as 45 minutes to an hour. Are you supposed to provide entertainment for that period of time when you are facing a home invasion scenario? Perhaps put on some coffee? Not to mention the non-human problems, like coyotes, that rural people have to deal with. It is easy to say ‘ban all guns’ for city folk, they don’t even need them to begin with what with rapid police response times and solid and tested infrastructure providing them with all the services they need. Rural people definitely need at least long guns. 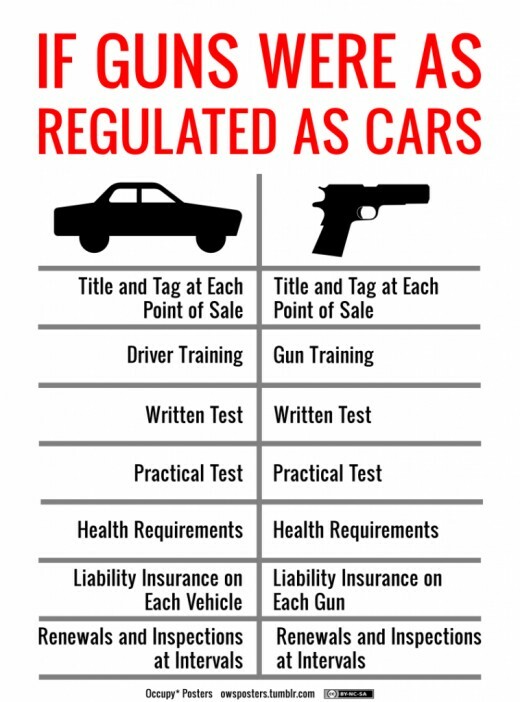 I cannot personally come up with a justification for owning pistols of any kind regardless on where you live nor can I easily justify the ownership of automatic weapons as these are relatively useless for things like hunting and I do not believe that any weapon should be purchased by a civilian when that weapon’s sole purpose is to kill other people. Long guns can be used for hunting as well as defending your home and so is also a useful tool for feeding your family as well as a weapon for defending them. This is really the only way to get proper gun control that is suitable to all the people everywhere. The federal authority will never be able to come up with a solution and that should not really surprise any of us, after all, we are all well aware that within our nations there are regions and sometimes those regions do not always see things the same way. We need to reflect this and respect it in our laws and how we manage our societies. Has the meaning of the 2nd Ammendment been hijacked? 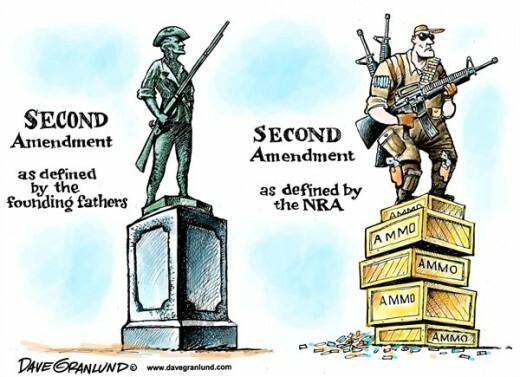 Has the 2nd Amendment been hijacked by Gun nuts? I actually support the right to bear arms in principal but understand that a modern society with big, modern and heavily populated cities needs to apply some logical restraint to this policy. First thing, nothing in this amendment specifies the right to actually own a gun…it states you have the ‘right to bear arms’ - which means you can possess a ‘weapon’. Anything can be a weapon. I own a long sword and as such have satisfied the second amendment. There is nothing to say specifically that this amendment means you can own an assault rifle either – never mind a .50 cal sniper rifle. In fact, nowhere does this amendment actually specify any specific type of weapon being made available to the public at large. So then does anybody think it reasonable or logical to allow the wide spread distribution of military grade firearms to anybody and everybody? Not me that’s for sure and I am definitely a ‘do it yourself’ kinda guy that does not like government interference nor do I appreciate petty laws and an overabundance of regulations yet I do not support the widespread distribution of military grade weapons to even our civilian police forces let alone individual people who have absolutely no training in the proper care and use of said weapons. Never mind that the entire 2nd amendment is misrepresented to justify the personal ownership by individuals of military grade hardware. This type of hardware is all over the middle east but it’s presence does not stop dictators nor does it slow down repression, etc. In fact, the presence of military grade hardware in places like the middle east has only made things worse not better. 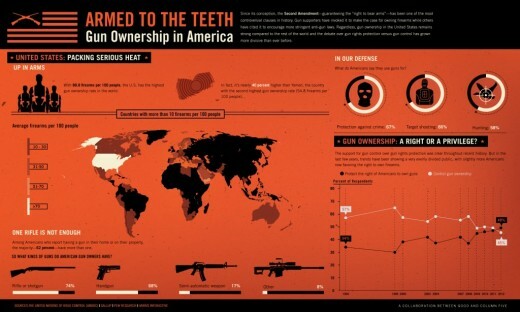 In Iraq every person and household had the right to possess one firearm for personal protection. Even the occupying American forces acknowledged this and this policy was in place long before America even invaded but did it help the Iraqis any? Did it deter Saddam? No. Did it deter an American invasion? No. What makes you think personal ownership of firearms in any way deters a nation from a planned invasion of your territory or, in fact, even deters a dictator from using repressive tactics? It has never been this way anywhere else this policy was adopted. So, while I support the second amendment I only do it in principal and refrain from supporting those who use this amendment to propagate their own personal agendas when it comes to firearms ownership. From an American standpoint there are a few problems with your thoughts. First, the second amendment is pretty plain about what arms are - while a ball point pen could be a deadly weapon, our constitution ties "arms" ownership to a "militia". 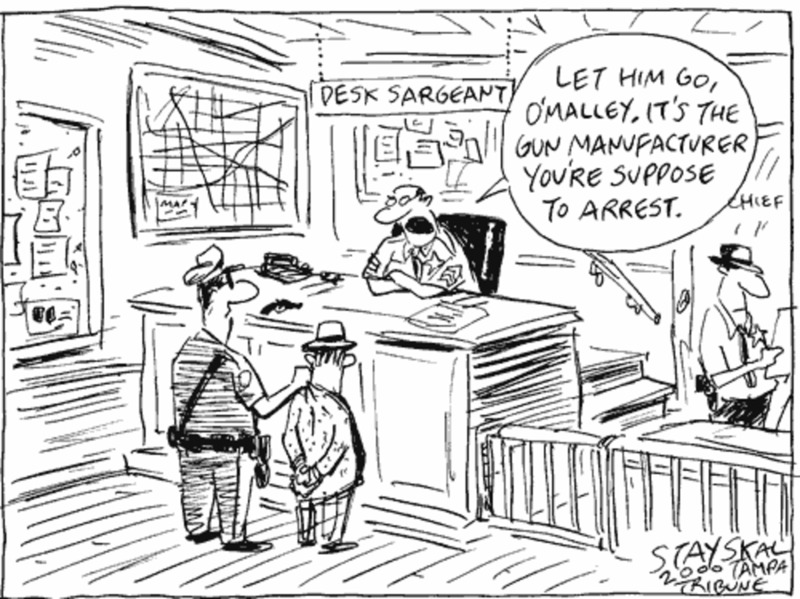 A ball point pen is useless to a militia and so is a sword - the wording plainly refers to guns. Secondly, very, very few "military grade" weapons are privately owned in the US. It is possible, but very difficult, to (legally) purchase or own an automatic weapon, and no one cares if you have a 50 cal. sniper rifle. The courts have sided with you (correctly, IMO) that not all guns need be permitted, but that is a far cry from banning common hunting rifles or handguns. And finally, collecting guns is no stranger or more dangerous than collecting cars or a host of other items. I very highly doubt that there has been a single shot fired in anger from one of those "collectible" guns, ever. Gun collectors don't think that way. And finally, allowing "cities" (undefined, and that's a problem) to keep citizens from exercising their constitution right (remember, this is about America) to own a gun isn't going to fly. Several have tried and all have been shot down in the court as unconstitutional. I will just add that the whole question is based on fear and hype. Did you know that more people are bludgeoned to death in the US than shot with all long guns (which includes those fearsome "assault rifles") put together? Did you know that the death toll from mass murders has risen since Australia took semi-automatic weapons away? Guns are not the problem - people and the propensity for violence is. Solve that and the whole gun problem dies a natural death, fail to solve it and taking every single gun from every single person in the country, US or Canada, will not slow the mayhem. 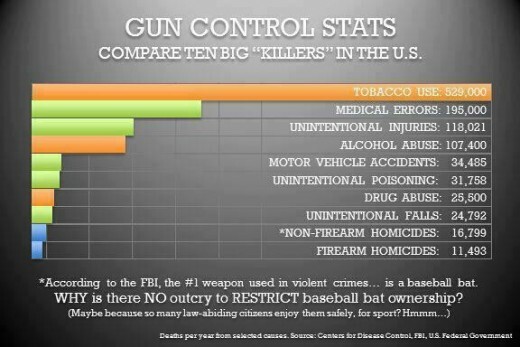 Statistics show that there is zero correlation between the number of guns in a society and the homicide rate. Indeed, US cities with the strictest gun control also have the highest homicide rates. I think when ten million people live in one area you need to act in accordance with what is good for the overall society even if this conflicts with what is fair for the individuals living in it. Else you get Chaos...I suppose your 'individual choice over safety for the majority' can be debated but if you do it that way then you have nothing to say when one of these individuals goes nuts and kills a bunch of people... seeing how these mass shooting seems to get a whole lot of public outcry I would have to assume that the majority of citizens would not support individuals having complete unrestricted access to any weapons they wish... however, the REAL point of my writing this here was to reveal that a FEDERAL solution to gun control is impossible and that gun control should be relegated down to state/municipal levels...that way, if you do want a fifty cal I'm sure there will be at least one American city you can live in that will let you have it... but for those who find such 'desires' dangerous to the overall good of the society - they will also have a city to live in... I also think it incredibly selfish to put your own concerns ahead of the majority of citizens you live around... but then this attitude of individual above society is why America is in the state it is in today and why you cannot use things like National unity (which you don't have) to reverse these things and correct your problems. I have two major objections to your thoughts here. The first is that our constitution does not say that we have the right to bear arms...IF Robin Olsen thinks we "need" one. "Need" is not addressed at all, and whether you think a gun is needed is irrelevant. Instead, "want" is what matters, and that the collector you disdain "wants" a gun is all that is needed for him/her to have one. Second is that the majority of a city should be able to circumvent the constitution because they fear guns and would deny others their constitutional rights. I'm not familiar with Canadian law, but in the US being in the majority does not automatically give the right to control what others do; the constitution is more about protecting individual rights than giving the majority power over minorities. Beyond that, city dwellers have as much right as anyone else to hunt, target practice or simply collect guns. Taking that right away simply out of fear is completely unreasonable. You try to get around this by again noting that there is no "need" as police are nearby, but that is neither true nor relevant to gun ownership. Finally, I will go on record as saying I've never seen a valid reason for strong gun control. While I support mandatory training and some other safety requirements, simply making guns illegal cannot be supported by any stretch of the imagination. While removing guns from society may reduce GUN crimes and death, it does absolutely nothing to reduce the overall murder rate - this has been shown to be true worldwide although gun control advocates limit themselves to discussion of GUN deaths and forbear to mention total murder rates. As your graph plainly shows, GUN deaths lag behind murder rates already - removing guns will only increase the "non-firearm homicide" category without changing the total at all. Jack is actually using Charleston as a valid reason to own automatic weapons by saying that the police in Charleston could not in any way have saved those people so everyone in a church should have a AK 47 slung over their shoulder and that this is the solution to Charleston...do you agree? Or did you READ the article and see the part where I actually think that Charleston should have the legal right to determine which guns are allowed in Charleston and which are not? Sorry, I have to chime in here. How do you figure Charleston is the only example? That is just the most recent example. Greg. Jack is attempting to distract the conversation by focusing it completely on one bad event. you do not make a national policy based solely on the events in only one city or region, especially a country the size and complexity of the USA - this is why gun debates get out of control and nothing ever changes...tactics like this. Cree sez: Police response times in the city do not justify needing a gun in the city. Jack replies: Please explain that concept to the good folk in Charleston. Hmmmm. Lots to think about there. What if I get back to you manana? First: Gun nuts don't talk about 'die trying' they try to paint a victory only scenario and use that victory only scenario to justify a 'Fort Carlson' amount of guns (I like that) - you can die trying to defend your self regardless of what weapons you may have at your disposal. No one limits your choice to 'die trying' by restricting weapons ownership and you have the same percentage chance of victory against an invading army with a long gun bolt action rifle as you do with a AK 47 - which is none at all. In fact, no law at all would prevent anybody from the 'die trying' approach. Those who speak of home defense and limit the conversation to thwarting criminals I can get into the reasoning there, but not to 'repel an army' - individuals have no hope at all of doing that in today's modern world. Under the freedom of choice regardless of the cost argument Heroin should be totally legal, have no age restrictions at all and be made readily available at the corner store...but it isn't cause Heroine is not a good thing. So freedom, while I support it must come with a grain of salt in the modern world. HOME DEFENSE ENTHUSIASTS-In your scenario, you tell us that basically, if ‘Mr. Bad’ wants to harm you, he will, in spite of the fact that you might have the Fort Carson equivalent of firearms. While that may be so, and it sounds like you have the extensive infantry experience to weigh in here, SOMONE ELSE HAS THE RIGHT to defend himself and his family-or he has have the RIGHT to die trying. You also speak of gun collecting hobby and laugh at those who only want to collect guns. That may not be my choice, it certainly is not YOURS, but that is the choice guaranteed someone else; as long as he/she is not harming anyone else. I am with you in that decisions about gun ownership should be handled on the local level. Even that hasn’t worked so well; Chicago is an example of a city with EXTREMELY tight gun-control laws. Possibly the tigetest laws on the books. But their cognition of crimes with guns and gun violence is on the rise and if I have my stats right, 114 have died so far this year, in the city where gun ownership is tough and laws are the toughest on the books. But, THE ENFORCEMENT OF THOSE LAWS? “First thing, nothing in this amendment specifies the right to actually own a gun…it states you have the ‘right to bear arms’ - which means you can possess a ‘weapon’. “ True, whatever YOUR definition of what a ‘weapon’ is. Clothing pin, Consider, that anything, ANYTHING can serve the function, just some more lethal than others. “What makes you think personal ownership of firearms in any way deters a nation from a planned invasion of your territory or, in fact, even deters a dictator from using repressive tactics?” It is not a matter of deterrance that firearms flourish (we all saw that Saddam and others have used the repressive tatics or which you speak.). So there must be something else. It is a RIGHT guaranteed, that FREEDOM of choice. You don’t need the 2nd amendment to guarantee you that right, but what separates us from many countries? We have CHOICE. Choice to use and as long as there’s a fiber in my being and as long as I’m not hurting you, I am of the persuasion that denying me that choice is denying me a basic right. You, my family, members of the military and so many fought and died for many reasons; one of which is that we could have the freedoms we enjoy today and one of those freedoms is the freedom to chose. Epleeba1 - your comment is well thought out and makes sense. I actually hear your call for freedom but freedom when living around 10 million other people has to come with some logical restraint as true freedom is true chaos. However, Police response times in the city do not justify needing a gun in the city. In a rural community 'waiting for a policeman' can certainly be very dangerous in a home invasion scenario. Unless that city is Detroit I guess... there are always exceptions. If individual police in individual cities are too inept or incompetent or simply like to shoot people too much and that keeps citizens from calling them then the citizens of that city need to sort that out for themselves. No one is 'blaming the gun' - simply acknowledging that not everyone should have access to every type of gun. When a driver of a car gets drunk and drives we take away his car right? It's not the car's fault the driver got drunk. We also acknowledge that certain types of people should not be driving. Severe mental disabilities for one but these same type of people can purchase guns. When a gun owner behaves improperly with his firearm (open carry or not) he should have that firearm confiscated. He should be fined and a period of 'no ownership' can be assigned, just like a drunk driver will lose his license over repeat offences. 'Personal Freedom' can be best applied in a rural areas. And the second amendment CLEARLY states a right to bear arms and does not state what type of arms that means and I think was meant more to reinforce the individual's responsibility to oppose tyranny rather than simply own the biggest and baddest gun. In the US today most see the second amendment as the exact opposite and while they do own lots of guns they make no effort to oppose any sort of tyranny and live in fear anyways. In Canada most who own guns have clear reason to do so. They are hunters or farmers and there is not a lot of weapons in the cities to begin with. Very few collectors. I have guns, bows, crossbows, long blades, etc. I am not afraid of weapons at all. I live rural so the lifestyle does not freak out the city folk. Who are sketchy at best. I just don't think having everyone in a large city packing weapons around is a good idea at all. But, it seems to me the base of my article , that weapons control should be a state/municipal matter and not a federal matter seems to be unchallenged, most of the comments seem to be from people who are frightened of losing a weapon they have no real use for to begin with. You embarass yourself too as I have 6 years of infantry experience (which is probably a lot more than you have) and yes there is definitely military grade weapons and firearms that are different in both style and purpose from your standard long gun. A .22 bolt action rifle is a FAR CRY from a AK 47. Why don't you write an article explaining why you should have the 'right' to own military hardware like assault rifles and automatic pistols? "I actually support the right to bear arms in principal but ..."
In other words, you don't really support the right to bear arms. "So then does anybody think it reasonable or logical to allow the wide spread distribution of military grade firearms to anybody and everybod"
There's your giveaway that you are either a poser or a natural liar. IF you were actually in the military then you KNOW there is no "military grade firearms" being sold to the public over the counter.
" I see no justification "
Thank God it is the "Bill of Rights" and not the "Bill of What Robin Sees Justified." 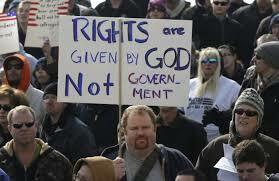 There is a belief in personal freedom that goes beyond the Second Amendment. This freedom is not about guns but guns are a part of the idea. People enjoy many hobbies and gun ownership is a valid hobby. I do not keep most of my guns locked away because they are inherently dangerous but to keep them away from being made dangerous by violent people. If you cannot understand the gun ownership idea, I cannot help you unless you want to be helped. I cannot understand the fascination of philatelists but I do not begrudge them their activity.